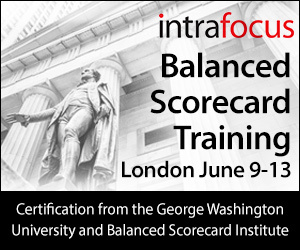 Intrafocus and the Balanced Scorecard Institute (BSI), a Strategy Management Group Company head-quartered in the U.S. with partners worldwide, are now working together to provide Balanced Scorecard Professional certification courses in the UK and Ireland. Two courses leading to professional certification will be offered: a five-day Balanced Scorecard Professional (BSP) certification course and a five-day Balanced Scorecard Master Professional (BSMP) certification course. Certification, following successful course completion and passing an examination, is given by the Balanced Scorecard Institute and the George Washington University College of Professional Studies. The Balanced Scorecard Institute is the original certifying body for balanced scorecard professionals worldwide. The first course, the five day Balanced Scorecard Professional, will be held in London starting on June 9th 2014. The course focuses on balanced scorecard strategic planning and management. It uses the Institute’s Nine Steps to Success™ methodology and is fully consistent with the basic balanced scorecard concepts and terminology originated by Drs. Kaplan & Norton. It was developed by the Institute for executives and members of balanced scorecard teams who want to learn how to build, deploy, and sustain scorecard systems. It is for anyone who wants to incorporate lessons learned and best practices into the development of a strategic management process. It is also designed for anyone who has an existing scorecard and wants to turn it into a robust strategic planning and management system. “We are delighted to be working with Intrafocus” says Howard Rohm, Co-Founder and CEO of the Balanced Scorecard Institute, “They have brought a new dimension to our courses through their local expertise and existing knowledge of our methodology”. The Balanced Scorecard Institute provide training, certification and consulting services to commercial, government, and non-profit organizations worldwide. The Institute applies best practices gained from hundreds of consulting assignments in balanced scorecard, strategic performance management and measurement, strategic planning, and change management. Institute programs help executives, managers and analysts transform their organizations into “performance excellence” organizations. “Working with the Balanced Scorecard Institute is a real privilege for us” says Clive Keyte, Managing Director at Intrafocus “the BSI Nine Steps framework provides an industrial strength methodology, renowned throughout the world as the best way to align business to strategy." Intrafocus is a business performance management software reseller and consultancy. It has invested heavily in lighter-footprint performance management software and training. Intrafocus believe that companies and organisations want easy to use web-based tools to examine and manage their performance data more effectively. QuickScore™ is the only Balanced Scorecard Software formally recommended by the Balanced Scorecard Institute. It provides the means to link company strategy to objectives and metrics and finally to strategic initiatives. The sophisticated tracking interface turns metrics into ‘scores’ which are then rolled up providing a typical red, amber, green, traffic light assessment for all levels within a company or organisation. This delivers an at-a-glance health-check to departments, divisions and headquarters that can be used as the starting point to drill-down back down for detailed information. * For more information regarding media usage, ownership and rights please contact Intrafocus.